Mesobotox treatment is the introduction of a diluted solution of Type A Botulinum Toxin (Botox) into the facial skin in order to give a more youthful and glowing appearance to the face, softening the folds and wrinkles, regularizing dilated pores, and a smoother skin surface. It is also used to lift and shape the eye brow, remove chin dimplings and creasings, as well as reduce neck folds and cause facial and neck rejuvenation. However, mesobotox treatment needs to be repeated at regular intervals of 4 - 6 months if you want to keep the healthy and glowing expression of your face and neck and keep away the aging effects of lines, wrinkles and folds. On the other hand, mesobotox therapy can be frequently used in combination with other treatments, such as fillers and face lifts, in order to improve and enhance the effects of the latter treatments. By relaxing the underlying mimic muscles of the face, mesobotox helps you get a healthier, younger, smoother and more beautiful skin texture. 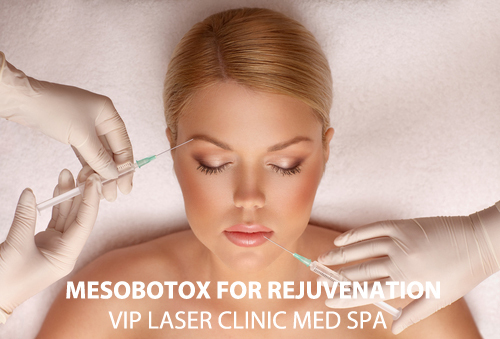 Mesobotox helps you rejuvenate rapidly and effectively, without any side effects.